The story was originally published by The Guardian and is reproduced here as part of the Climate Desk collaboration. The US and Canada declared they would help lead the transition to a low-carbon global economy on Thursday, in a dramatic role reversal for two countries once derided as climate change villains. The shared vision unveiled by Barack Obama and Justin Trudeau ahead of a meeting at the White House commits the two countries to a range of actions to shore up the historic climate agreement reached in Paris last December. The two leaders committed to rally G20 countries behind the accord, promote North American carbon markets, cap emissions from hundreds of thousands of existing oil and gas wells, and protect indigenous communities in a region which is warming beyond the point of no return, according to a statement from the White House. The initiative announced on Thursday brings the US a big step closer to meeting its own Paris target by committing for the first time to cut emissions of methane—a powerful greenhouse gas responsible for about a quarter of warming—from existing oil and gas wells. The biggest news however might be the final break with the policies of their predecessors who obstructed global efforts to fight climate change. In his seven years in the White House, Barack Obama has steadily transformed the US into a climate leader on the international level. With Thursday’s announcement, Obama appeared to be passing the baton of climate leadership to Trudeau. Trudeau, just months into his prime ministership, has made clear he wants Canada to play a similar leadership role at home and on the global stage, White House officials told a conference call with reporters on Thursday. Under the initiative, the US and Canada will work to ratify the Paris agreement as soon as possible, lending an important symbolic boost to prospects for bringing the Paris agreement into force as soon as possible after the 22 April signing ceremony. The agreement must be ratified by at least 55 countries representing 55% of global emissions. 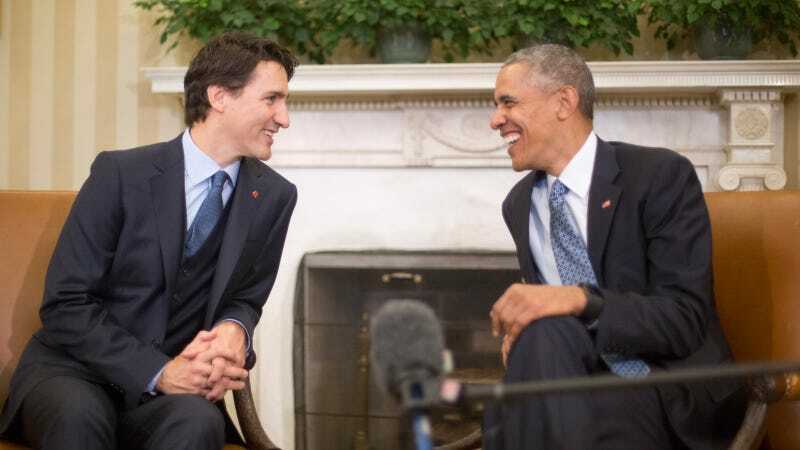 Obama and Trudeau also said the leaders would move quickly to finalise their long-term emissions reductions strategies discussed at Paris, unveiling a plan by the end of 2016, and that they would lobby other major G20 industrialised countries to do the same. An early opportunity for such lobbying comes later this year when Canada and the US will bring in Mexico to the new North American partnership on climate. The White House statement also suggested the two leaders would try to consolidate existing regional carbon markets, in line with other provisions in the Paris agreement for encouraging the transition to a clean energy economy. Turning closer to home, the initiative also takes a big step to curbing a powerful climate pollutant in methane, whose emissions rose rapidly with the boom in oil and gas production across much of the US and Canada. The two countries committed to cut methane emissions from the oil and gas sector by up to 45% below 2012 levels by 2025—in line with previous proposed rules from the Environmental Protection Agency (EPA) and Canada’s major energy-producing province of Alberta. On Thursday, the EPA raised the bar even farther, pledging to draft rules to cut methane from existing oil and gas wells—which had been a key demand for campaign groups. The commitment won widespread praise from environmental campaign groups who noted that tackling methane was one of the most effective ways of reducing US and Canadian emissions overall. The US and Canada are both among the top five global emitters of methane. On the Arctic, the two countries said they would convene a high-level summit next August to try and keep pace with the record temperatures, sea ice loss, permafrost thaws and wildfires, that are creating dangerous and irreversible impacts in the polar region - but also contributing to changing weather patterns and sea-level rise globally.